Our Christmas Journey began a number of years ago and many things have happened since then. So here is a brief summary of Twins Feather Trees. Sharen and I are identical twins and that is why we named our company Twins Feather Trees. We saw our first feather tree in a friend's apartment. It was a small green tree. We were told of its early 1900's German origin and although we knew nothing about antique Christmas Collectibles, a spark was kindled. We wanted a feather tree, and the search began. That was in 1981. About six months later, I found a 45" tree with tiny tin candle holders attached to the branches for $30.00 and Sharen found a 36" tree in beautiful condition at an auction for $45. Over the next few years we found wonderful trees including a cobalt blue 4' tree with a red and blue holly stencil on the base and several white trees. But it was in September of 1982 that we found the tree that would propel us on to a new career. We had been at an antique flea market since dawn and it was now mid-day. We decided to take one last stroll around before leaving. Then is a booth Sharen saw a small feather tree, about 24" tall for $2.00 in perfect condition. As we carried it to the car we were hounded to sell it. Perhaps there were more collectors than feather trees. Looking back at that event, perhaps we were guided to find that small tree so late in the day. In October of 1983 we made our first tree. We reproduced the flea market find. Without disassembling the tree, we figured out the feather work and our dad helped with the rest. He is a carpenter and cabinet maker so he was able to work out the details. He made the bases for the trees both square and turned, just like the originals. We wanted everything about our new trees to look as much like the antique ones as possible. Once we achieved the look we wanted we were ready to show the trees to the public. So in the spring of 1984 we went to Maumee Ohio for our first show. That first show was disappointing but then Early American Life Magazine did an article on feather trees and mentioned us. We were the first people in the country to reproduce the feather trees. Several other magazines wrote articles on us and used the trees in their publications including Country Living, Country Home, Ladies Home Journal, and Country Handcrafts. The feather tree was once again celebrated and given its rightful place in decorating. In fact we went 'out on a limb' and started making our seasonal trees which became popular for holidays throughout the year. We had been in business for 20+ years. However things change and so has our business situation. 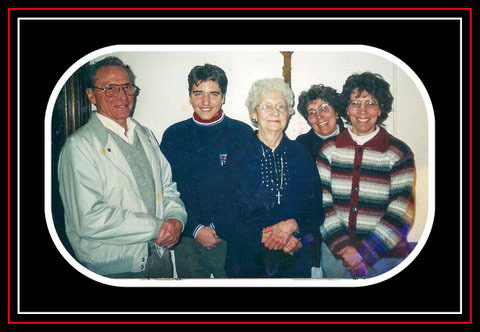 In May of 2010, our mom who was very much involved in our 'cottage industry' passed away at age 90. She was a very sweet lady and always helpful at our open house events getting things ready and greeting customers. 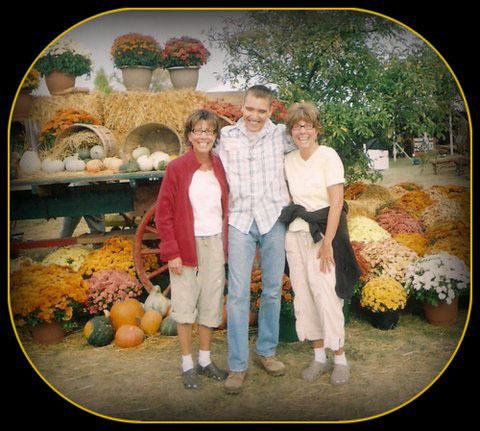 Another heart breaking event occurred a few months later in July, Sharen passed away from cancer. I almost gave up the tree business but my dad and son Alex told me to seriously consider keeping it. I wanted to continue the work but it felt so different. I didn't do much that year but I kept getting orders. So gradually I started making the trees again. I knew Sharen wanted me to do the trees. Sharen wanted me to be happy. This newly revised website, though long overdue, has feather trees in both the traditional and seasonal varieties that Sharen and I made plus some new items you will find appealing and fun to decorate. As always, each item is hand made in Cincinnati, Ohio by me with help from my dad. He will be 90 in October but still helps as much as he can. The feather trees which are made with goose feathers that are cleaned and dyed by me are never mass produced.